In this new edition, Joanne Elphinston introduces functional force management (FFM) as a concept for understanding the different control strategies needed between sports, how it influences training choice, and its relationship to injury prevention as well as performance. The book includes an updated “Foundations and Fundamentals” section with an entirely new chapter on FFM, as well as in-depth exploration of these principles in each key body zone. 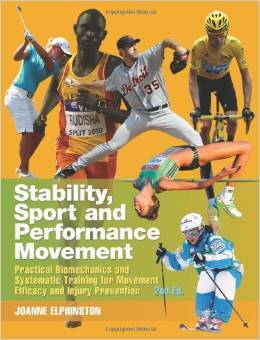 Packed with full-colour images to illustrate the techniques and concepts involved, Stability, Sport and Performance Movement provides a comprehensive chapter on analysing movement, followed by a progressive integrated programme of stability, mobility, coordination and balance to create the foundation for effective movement, from early activation through to higher level neuromuscular activities. Sample programmes and clinical examples help the reader to understand the application of this approach across a variety of sports. The techniques and philosophy within the book have been applied with international-level athletes in disciplines as diverse as swimming, badminton, gymnastics, karate, cycling, weight lifting, basketball, athletics, snow sports, football, golf, equestrian sports and tennis. However, they have been applied equally effectively by people of all ages and ability levels as they come to understand their bodies and learn to work with them systematically from sound foundations. This is likely the most influential applied anatomy / training book I have ever read. Joanne Elphinston is a performance consultant in the fields of elite sport and the performing arts, an international lecturer, physiotherapist and developer of JEMS, an integrated movement approach used in rehabilitation, coaching, well being and performance. Her client list includes the British Olympic Association, Olympic, Commonwealth and World Championship medalists in summer and winter sports, professional golfers and footballers, dancers and musicians. Joanne’s consultancy includes advising professional sporting organisations on technical movement enhancement, injury prevention and rehabilitation. She also has extensive experience in child and adolescent development for sport and its progression into senior competition, with her popular book, Basträning För Barn, currently published in Swedish and Norwegian. With Paul Pook, Joanne also wrote the best selling The Core Workout.